Word Clouds like the one below make interesting visuals, but they can also be used in the classroom as a learning tool! The 21st Century Educational Technology and Learning blog by Michael Gorman recently listed 125+ ways to use Wordle Word Clouds in the classroom. Gorman shares a collection of ideas that can be applied to almost every subject. Below are just a few of his suggestions. Click on the link above for his complete listing. For science: when classifying objects - make a word cloud for each classification. Make the classification heading bigger than the rest of the words. Put both words and short definitions into a word cloud. Have students find a way to connect the words and definitions - be redoing the word cloud and color coding the items that go together, or drawing lines between the matches. 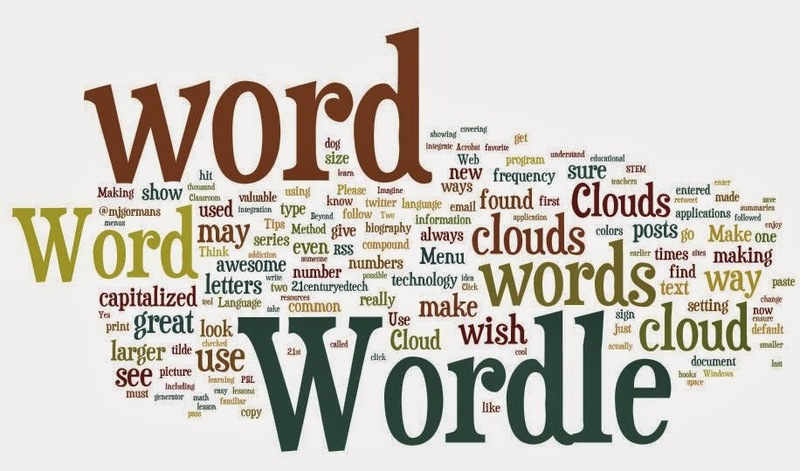 Have students use the word cloud to analyze their frequency of word usage in writing. For a writing class: Have students create a story, poem, haiku, free verse, etc. from words they see in the word cloud. Or have students create a word cloud from a piece they have already written as a way to visualize word usage. To teach the use of a search engine: Have students put a search term into a search engine. Have them copy and paste the results and make a word cloud. Have students analyze the results to determine why certain words are larger in the word cloud. Were there any unexpected outcomes in the word cloud? Social studies: Create a word cloud to illustrate how countries of the world (or states in a country) rank with related themes such as oil production, GDP, industries, languages, etc. The heading would be the resource and countries would be in the word cloud showing their rank by size. There could be other variations. Use advanced number feature. Diet and nutrition: Have students keep a food journal of what they eat for a week. If they eat French fires three times they record that. They then enter their entire journal entry being sure to give a number value in the advanced more or pasting the word the correct number of times. They should end up with a word cloud of their diet. Presentations: Students create a word cloud to illustrate their favorite artist, athlete, musician, or historical person and do not include the name. They then present a word cloud to class and students try to guess who the person is. Finish by including their word cloud as part of a poster with a picture of person, name of person, and a paragraph about him/her. Foreign language: Put both the English and foreign word into a word cloud. Have students find a way to connect the words. This could be redoing the Wordle with a tilde between words so they go together. It could be color coding the words using the advanced edit feature. Perhaps they just draw lines between them. Foreign language: Have students word cloud a foreign newspaper article. What are the common words that are used? You may wish to even use show word count. Do it by showing common words. What are the most common? Also, try it with- out common words. Can students tell what the news article may be about before reading? To get started with Word Clouds, visit Gorman's article, "12 Valuable Wordle Tips You Must Read...Word Clouds in Education" for tips in using Wordle and other ideas for integrating Word Clouds into education.